This article was originally published in Gettysburg Magazine Issue Number 12, January/1995. Morningside House, Inc. reserves all rights to this and other articles from Gettysburg Magazine reproduced on the Gettysburg Discussion Group Web Site. Bruce Trinque is a native New Englander, residing in Niantic, Connecticut. He graduated from the University of Connecticut with BSE and MS degrees in mechanical engineering and currently works as a manufacturing process engineer. His interest in the Civil War was sparked by the Centennial observations when he was a junior high student. Mr. Trinque is editor of The Dispatch, the newsletter of the Southeastern Connecticut Civil War Round Table. The author's long-time interest in the 14th Connecticut Infantry led to research about adjacent units at Gettysburg and to the present article. His writings about the Civil War and the American West usually delve into the small mysteries and misconceptions which enliven the study of military history. So wrote Thomas M. Aldrich in his history of Capt. William A. Arnold's Company A of the 1st Rhode Island Light Artillery. This moment of drama during the repulse of the great Confederate attack against Cemetery Ridge on the afternoon of July 3, 1863, was commemorated in 1986 with the erection of a monument at the spot described by Aldrich, just in front of the famous stone wall over which peer the black muzzles of cannon designating the position of Arnold's battery. Visitors to Gettysburg National Military Park stare past these guns at the pink granite marker and they can walk down to the monument to read the story of the 26th North Carolina Regiment, literally cast in bronze on the tablet atop the marker. Photographs of the new monument now illustrate magazine articles about the battle.2 The incident is also memorialized in artist Mort Kunstler's "The High Water Mark," unveiled in a ceremony at the Gettysburg Park museum during observation of the 125th anniversary of the battle. This vivid painting shows men of the 26th being blown back by the discharge of double-canister.3 Careful students of the battle, however, must ask themselves the question: what really happened? The Union defenses atop Cemetery Ridge ran southward along a low stone wall. Near the center of the Federal position, the wall veered sharply west toward the distant Confederate lines for about eighty yards and then turned again to continue south. This jog in the stone wall would become forever known simply as "The Angle." A short distance south of the Angle and east of the stone wall stood a clump of trees easily visible from the Confederate positions across the wide valley. Robert E. Lee selected these trees as the aiming point for the attack he ordered on the third day of the battle at Gettysburg. In preparation for the assault, the Confederates massed more than 170 cannons, those of Longstreet's corps under the command of Col. Edward Porter Alexander to fire on the Union defenses, particularly concentrating upon the artillery batteries at the Federal center. Directly adjacent to the clump of trees was Lt. Alonzo H. Cushing's Company A, 4th U.S. Artillery. To the south was Lt. T. Fred Brown's Company B of the 1st Rhode Island Light Artillery. North of the trees and north of the Angle itself was Arnold's battery, also of the 1st Rhode Island. Alexander's goal was to drive off or disable these and other batteries before the Confederate infantry launched an attack. He ordered his cannons to open fire at approximately 1 p.m. Shortly before 3 p.m., concerned about his heavy expenditure of ammunition and encouraged by the withdrawal of some of the Federal artillery, Alexander sent word to Lt. Gen. James Longstreet that the moment had come to begin the infantry attack. Maj. Gen. George E. Pickett's division, containing the Virginia brigades of Garnett, Kemper, and Armistead, formed the right wing of the Confederate attack force. Pickett's men would hit the Union lines south of the Angle, while Pettigrew's and Trimble's divisions struck north of the jog in the stone wall. Behind the stone wall on Cemetery Ridge, waiting for Pettigrew's and Trimble's Confederates, were several Federal units. Just north of the Angle stood what was left of Arnold's Company A of the 1st Rhode Island.10 To the north of Arnold was the 14th Connecticut Infantry, then the 1st Delaware, and then the 12th New Jersey. Other Union infantry regiments were positioned behind this front line. The infantrymen along the wall were deployed in a formation much shallower than that of the attacking Confederates. Indeed, the men of the 14th Connecticut were stretched into a meager single rank, rather than the standard two-rank line of battle from the tactics manuals.11 Each Union regiment along the stone wall thus faced several advancing Confederate units. If an examination is made of Confederate regiments from which battleflags or officers are known to have been captured by the 14th Connecticut, one clear and logical fact is immediately apparent: the identified units form a virtually solid block in the Southern attack formation. This includes four of the five regiments in Fry's brigade, the right flank regiment in Marshall's brigade, and the two regiments at the right end of Scales' brigade. These units had obviously fought in front of the 14th Connecticut.16 It is also evident that the Confederate assault force maintained the basic integrity of its formation until the survivors fell back. Individual regiments had not wandered blindly about the battlefield, striking randomly against the Federal line. Comparing Union and Confederate orders of battle, it is at least broadly accurate to say that the 14th Connecticut was faced by Fry's brigade, the 1st Delaware had Marshall's brigade in its front, and the 12th New Jersey had Davis' brigade before it. Scales' brigade was also in front of the 14th Connecticut, but its left flank must have extended in front of the 1st Delaware.17 Lane's brigade was before the 12th New Jersey, although the right flank was evidently in front of the 1st Delaware. Toward the end of the Confederate bombardment, men and equipment battered by enemy fire, Captain Arnold's ammunition nearly exhausted, and operating under Hunt's orders, Arnold withdrew most of his guns from the exposed ground on the ridge.24 One or two artillery pieces, however, were left at the stone wall, close to the Angle, that site marked with six cannons on the present battlefield as being the location of Arnold's battery. 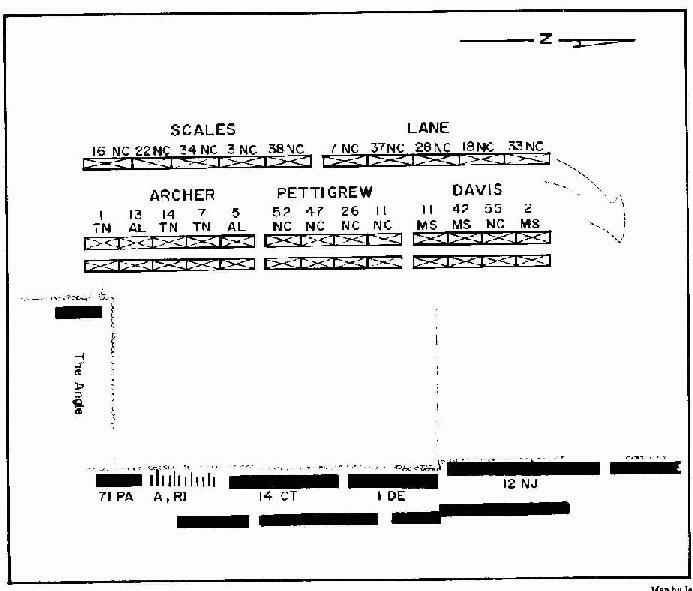 Only one cannon, left near the corner of the wall, was still operational, although another disabled gun was nearby.25 This withdrawal left a hole in the Union line between the left of the 1st Delaware and Arnold's remaining serviceable piece. Ellis ordered his men to their feet. They filed to the left and moved forward to the stone wall to fill in the gap. The 14th Connecticut had entered the battle with a strength of only 170 officers and men. Because of losses at the Bliss Farm and due to the detachment of two companies on the skirmish line, Ellis now commanded approximately one hundred men.26 To fill the open space, the 14th spread out in a single line of one rank.27 Detailed accounts of this change in position leave no doubt that most of Arnold's battery had been pulled back, despite Aldrich's failure to disclose this information in his regimental history. Regardless of Aldrich's silence on the withdrawal, there may still be a core of truth to his narrative of the final shot from Olney's gun, presuming this cannon to be the one serviceable piece Arnold left behind. Nonetheless, it is nearly inconceivable that Olney knew the designation of his target when he ordered Private Barker to pull the lanyard. In the heavy smoke and confusion of battle, no one in Arnold's battery could have expected to read the designation on an enemy regimental battleflag. Therefore, identification must have been made afterwards, either through examination of a captured flag or by questioning prisoners. As discussed above, the 26th North Carolina was definitely not in front of a gun from Arnold's battery. What command, then, was the target of Olney's final shot? And is there a reasonable mechanism for the 26th to have become associated with this incident? To address the first question, there are several answers possible, with the identity of those commands known to have been in front of the 14th Connecticut providing a guideline. Whatever regiment was fired upon by Olney, it should have been on the (Confederate) right flank of the block of identified units. According to the best available information, the right flank regiment in this portion of the Confederate front line was the 1st Tennessee. In the rear line was the 16th North Carolina.28 The 14th Connecticut captured the flags of both regiments. Aldrich's narrative implies that the Confederates began to fall back immediately after Olney's shot.29 This indicates that the incident occurred when the rear line (Scales' brigade) was attempting to breach the Union defenses, the leading double-line (Fry's and Marshall's brigades) having already been stalled. To repeat, the right flank regiment in Scales' brigade was the 16th North Carolina. In summary, evidence places the 16th North Carolina at the right place at the right time (if being the target of a double load of canister can be said to have a "right time"). Furthermore, a simple error either in noting the regimental designation on a captured battleflag or in later recollecting a chaotic and stress-filled event could have transformed a "16" into a "26." While no final conclusion can be drawn, the Confederate command devastated by the last shot of Arnold's battery was probably the 16th North Carolina of Scales' brigade. 1. Thomas M. Aldrich, The History of Battery A, First Regiment Rhode Island Light Artillery, in the War to Preserve the Union, 1861-1865 (Providence: Snow & Farnham, Printers, 1904) p. 216. 2. For example, see Gettysburg Magazine, no. 8 (January 1993):87, and no. 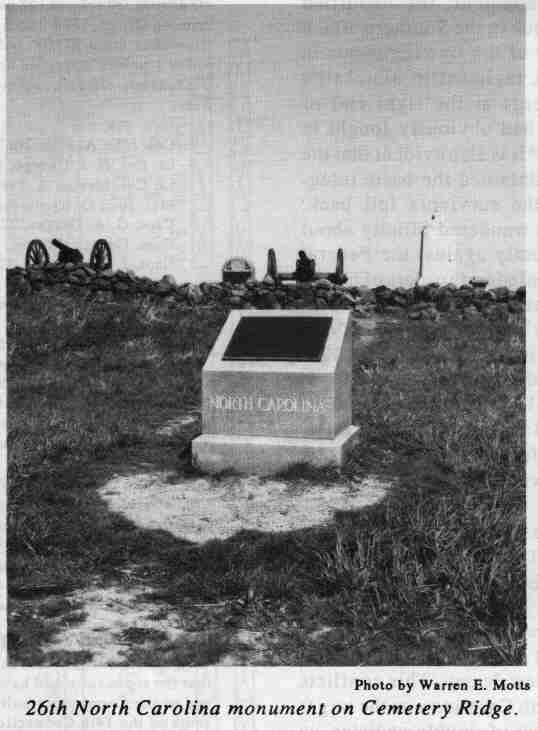 9 (July 1993):72, although in the latter case the caption mistakenly identifies the marker as being that of the 14th North Carolina. 3. Mort Kunstler and James McPherson, images of the Civil War (New York: Gramercy Books, 1992) pp. 116-17. Also, Mort Kunstler and James McPherson, Gettysburg: The Paintings of Mort Kunstler (Atlanta: Turner Publications, Inc., 1993), pp. 96-97. 4. Aldrich, The History of Battery A, p. 211. 5. Confederate brigades and divisions were generally known by their commanders' names. By the third day of fighting at Gettysburg, heavy casualties had altered command arrangements. Maj. Gen. Henry Heth had been wounded on July I and Brig. Gen. J. Johnson Pettigrew took over command of Heth's division. Pettigrew's brigade, in turn, was led by Col. James K. Marshall. These commands, therefore, will be designated by who was commanding them on July 3. 6. John W. Busey and David 13. Martin, Regimental Strengths and Losses at Gettysburg (Hightstown, New Jersey: Longstreet House, 1986) p. 174. 7. R. Lee Hadden, "The Deadly Embrace", Gettysburg Magazine, no. 5 (July 1991):19-33. 8. George R. Stewart, Pickett's Charge: A Microhistory of the Final Attack at Gettysburg, July 3, 1863 (Boston: Houghton-Mifflin Co., 1959; reprint, Dayton, Ohio: Morningside, 1983) p. 87. 9. Ibid., pp. 300-1. See also Michael W. Taylor, "North Carolina in the Pickett-Pettigrew-Trimble Charge at Gettysburg", Gettysburg Magazine, no. 8 (January 1993):69. 10. Two companies of the 71st Pennsylvania had been deployed behind the stone wall at the inner angle itself. Some evidence exists that these men moved left and forward to join the rest of their regiment at the outer angle before the Confederate assault. John M. Archer, "Remembering the 14th Connecticut Volunteers", Gettysburg Magazine, no. 9 (July 1993):75. 11. Charles D. Page, History of the Fourteenth Regiment, Connecticut Volunteer Infantry (Meriden, Connecticut: Horton Printing Co., 1906), p. 151. 14. Ibid., p. 161. Major Ellis in his official report of July 6, 1863, reported the capture of a fifth Confederate flag, that of the 4th Virginia. This is, however, an error, as the 4th Virginia was not involved in the attack. Presumably, the battleflag was that of one of the Virginia regiments of Pickett's division, which had been in the Confederate assault force immediately to the right of Fry's and Scales' brigades. Maj. Ellis also stated that "there were many other field and line officers captured whose names were not ascertained." 16. Undoubtedly the 13th Alabama of Fry's brigade was also in front of the 14th, but the battleflag and officers of the Alabama regiment escaped capture or identification by the Connecticut men. The same may be true of one or more other regiments in Scales' brigade. 17. In regard to the relative positions of Fry's brigade and the 14th Connecticut Infantry, it is worth noting that according to the historian of the Connecticut regiment the flag of the 14th Tennessee, the center unit of Fry's brigade, was captured in front of the center of the 14th Connecticut. Page, History of the Fourteenth Regiment, pp. 152-54. 18. Although the relative position of the 26th North Carolina within Marshall's brigade cannot be established beyond doubt, this does not affect the argument presented here. Even if the 26th had been the right flank unit in the brigade, this would only mean that the regiment could have encountered the extreme northern end of the Connecticut unit's line. Arnold's battery was to the south of the 14th Connecticut. Maj. J. Jones, who commanded the 26th North Carolina, wrote in a July 30, 1863, letter that his regiment was on the right of Marshall's brigade and that this brigade was on the right of Pettigrew's division, placing him directly adjacent to Pickett's division. Taylor, "North Carolina in the Pickett-Pettigrew-Trimble Charge," p. 81. This is contrary to all other information about the attack formation, regarding the arrangements both of regiments within Marshall's brigade and of brigades within Pettigrew's division. 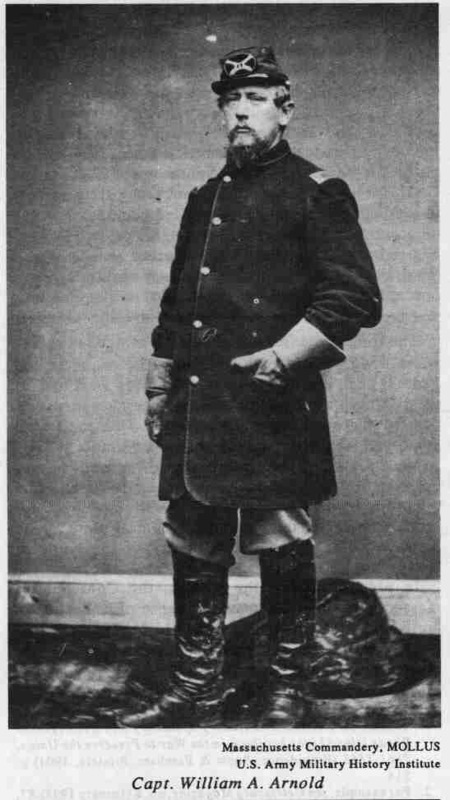 Lt. Gaston Broughton of the 26th North Carolina, for example, was specific that the 47th North Carolina of Marshall's brigade was on the 26th's right and Capt. Joseph J. Davis of the 47th North Carolina noted that Fry's brigade was to the right of Marshall's. Taylor, "North Carolina in the Pickett-Pettigrew-Trimble Charge," pp. 85, 88.) The reasons for Jones' error are unclear. The actual position of the 26th North Carolina is confirmed by the capture of its flag by the 12th New Jersey, positioned hundreds of feet to the north of the 14th Connecticut. Personal communication to the author from Richard Rollins, July 25, 1994, based upon information in the files of The Museum of the Confederacy, Richmond, Virginia. 19. OR, vol. 27, pt. 1, p. 239. 20. Page, History of the Fourteenth Regiment, pp. 150, 165. Also Henry S. Stevens, Souvenir of Excursion to Battlefields by the Society of the Fourteenth Connecticut Regiment (Washington, D.C.: Gibson Brothers, 1893) p. 26. See also Archer, "Remembering the 14th Connecticut," p. 75. 21. Page, History of the Fourteenth Regiment, pp. 143-49, 164-65. 22. At this time the battery occupied that space designated on the present National Military Park grounds by both the 14th Connecticut monument and also the six closely packed cannons representing Arnold's unit itself. In combat conditions, artillery pieces were not deployed with wheels hub-to-hub. Standard tactics called for fourteen yards between individual guns. Furthermore, Arnold's cannons during the bombardment were not at the stone wall itself, but several yards back, allowing the artillery crews room to move about freely. 23. Page, History of the Fourteenth Regiment, p. 149. 24. Henry J. Hunt, "The Third Day at Gettysburg," Battles and Leaders of the Civil War, eds. Robert U. Johnson and C. C. Buel, 4 vols. (New York, 1884-1888; reprint, New York: Castle Books, 1956), 3:374. 25. Sgt. Maj. Hincks of the 14th Connecticut wrote that "One or two pieces which had been pushed out further to the front were left behind." Page, History of the Fourteenth Regiment, p. 150. Chaplain Henry Stevens of the 14th carefully gathered information about the regiment's Gettysburg experiences for his speeches and writings. Stevens' information was that only a single operational gun was left by Arnold. Archer, "Remembering the 14th Connecticut," p. 75. Also personal communication from John Archer to the author, November 28, 1993. 26. Page, History of the Fourteenth Regiment, p. 151. 27. The two companies of skirmishers later rejoined the regiment during the Confederate advance, but the 14th maintained its single-rank battleline at the wall. 28. Stewart, Pickett's Charge, pp. 300-1. 29. Aldrich, History of Battery A, p. 216. 30. Busey and Martin, Strengths and Losses at Gettysburg, p. 290. 31. Stewart, Pickett's Charge, p. 226. Richard Rollins, ed., Pickett's Charge: Eyewitness Accounts (Redondo Beach, California: Rank and File Publications, 1994), p. 257. Personal communication to the author from Richard Rollins, July 25, 1994.